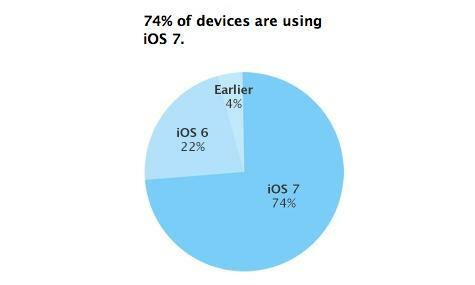 According to Apple, which based the numbers on App Store usage, the share of devices running iOS 7 is a whopping 74 percent. Given the short amount of time iOS 7 has been on the market —less than three months —the pick-up rate is astonishing. Apple first released the latest iteration of its mobile platform on Sep. 18 in concert with the iPhone 5s and 5c launch.